the world – from small 100 person venues to large scale music festivals with thousands in attendance. 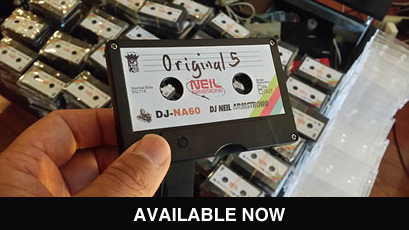 Neil initially gained notoriety for his mixtape projects, which showcased his DJ skills as well as his vast eclectic knowledge of music. These highly regarded mixtapes generated considerable press – most notably in Rolling Stone, Vibe,MTV.com, Theme, URB and Complex – and they often became the soundtrack of choice for many in the streetwear/fashion/music industry. The growing audience lead him to work with brands such as adidas, Undefeated and Fruition, which in turn led to working with large scale related industry entities like the NBA, BMW, and VH1 to name a few. Eventually Neil’s reputation as a turntable musician landed him a spot as Jay-Z’s tour DJ. From 2008-2010 he backed up Mr. Carter on 4 tours around North America, Europe and Africa. Neil held down the turntables for the televised 9/11 tribute at Madison Square Garden, and performed in front of 120,000 plus at the Glastonbury Festival in England. By far the highlight was performing for the inauguration of the 44th President of the United States, Barack Obama. This was the 1st time in history turntables and scratching were present for a celebration of this magnitude. DJ Neil Armstrong is truly an international DJ, one of the few who can say he has performed on 6 continents around the world. As a global music ambassador for adidas he continues on, bringing happiness to the people through music. Through social media (twitter, instagram, facebook) Neil has found a new way to connect with his audience, sharing his travel experience through the cultural unifier of food. Neil’s travel’s provide him the opportunity to eat a lot of local fair, cuisine and dishes most people don’t get to sample. Neil’s food posts are part enjoyment and part resource, as his feed has become a guide to where you can find good food around the world.